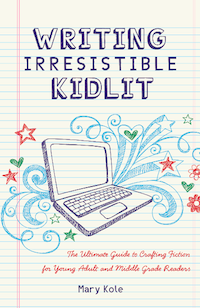 Today’s release of the hands-on how-to book for middle grade and young adult writers Writing Irresistible Kidlit (Writer’s Digest) gifts Moveable Type literary agent and KidLit.com creator Mary Kole with yet one more title: Teaching Agent-Author. Subtitled The Ultimate Guide to Crafting Fiction for Young Adult and Middle Grade Readers, Mary’s interactive book offers up a bevy of agent-learned tricks, treats and best of all tools certain to help writers learn and hone their craft as well as their world. She shares writing exercises, candid commentary and a collection of book excerpts and personal insights from bestselling authors and editors who specialize in the children’s book market. Mary joined Movable Type from the Andrea Brown Literary Agency where she distinguished herself as an inventive and entrepreneurial agent. 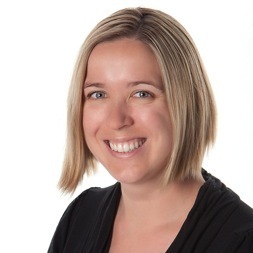 Her books include author-illustrator Lindsay Wards’ When Blue Met Egg (Dial), Emily Hainsworth’s YA debut Through to You (Balzer + Bray) and Dianna Winget’s A Smidget of Sky (Houghton Mifflin Harcourt). KidLit.com was named one of Writer’s Digest’s Top 100 Websites for Writers; over 50,000 readers visit the site monthly. This being Halloween, a favorite holiday of just about every children’s book writer and teacher I know, I consider Mary’s answers to my questions below both delicious, calorie-free Treats and writer-friendly Tricks, plural. (1) How did you become a Teaching (Agent) Author? I became an agent after reading for free at an agency to learn more about the publishing business. But I've always been passionate about teaching others, so I knew that I wanted to pass on what I was learning to writers. The publishing business is often difficult to wrap one's head around, so I wanted to pull back the curtain a little bit. I understand things better once I articulate them and explain them to others, so the teaching aspect of my work has also been invaluable to me. (2) Why and how did your book come to be? I started out as a writer, so part of it was definitely yearning to be a published author. But the book also became a personal challenge: Do I have enough to say about the writing craft and can I say it in a way that it earns its keep on my readers' writing reference shelves? I hope the answer to both questions is "yes," of course, and I'm excited to see the reactions once the book is out in the world. Since I was doing a lot of programming and teaching for Writer's Digest, publishing the guide with them was a natural fit and the process of actually getting the book deal was easy. The process of writing it, though, took a lot more stress and work, but I'm very happy with the finished product. (3) What are the Top Three problems you note in manuscripts when you’re reading as an agent? Beginnings are tough to do well, and I often notice that writers don't start with a strong sense of the present moment and present action. A lot of beginnings have tons of backstory and info-dumping and not enough conflict to hook a reader in. In terms of character, writers can always work on motivation and objective--a really strong reason for characters to be doing what they're doing, and an overarching goal that they work toward in the story. In a prose sense, I often find myself giving the following note: "You are saying something fundamentally simple in an overly complicated way." Not everything needs to be a showcase for Writing-with-a-capital-W. Sometimes there's style in simplicity. (4) What are the Top Three writers’ questions you receive at www.kidlit.com? Other than that, I've been answering writing questions on the site since 2009 and there are a lot of different concerns that writers have. I don't know if I can pick the runners up in terms of popularity. (5) Please share a favorite Writing Exercise. To really help writers individuate characters and think about voice, I like to ask them to describe the same scene or landscape from the POVs of two different characters. Think about syntax, word choice, what each character notices and how. This often drives home the point that each fictional person is unique and has a very distinct lens that should inform every choice that a writer is making. (6) You’ve worn so many hats while residing in the Children’s Book World! Which do you love wearing the best? I'd love to say "reader" but, to tell you the truth, there is no better way to frustrate one's love of reading than to actually work in publishing, where you are reading more than you ever thought possible and under time constraints. So I'll say that my favorite hat is "cheerleader," because there's no better feeling than believing in a project and championing it through to publication. Thanks, Mary Kole, for the opportunity to bring you and your new book Writing Irresistible Fiction to the attention of our TeachingAuthor readers. P.S. Trick or treat? You bet! 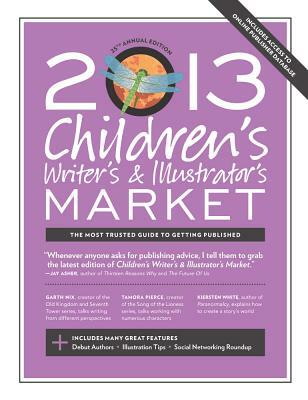 We’re giving away one copy of the 2013 Children’s Writer’s & Illustrator’sMarket (Writer’s Digest)! You must follow our TeachingAuthors blog to enter our drawing. If you’re not already a follower, you can sign up now in the sidebar to subscribe to our posts via email, Google Friend Connect, or Facebook Network blogs. Whichever way you enter, you MUST give us your first and last name AND tell us how you follow us. If you enter via a comment, you MUST include a valid email address (formatted this way: youremail [at] gmail [dot] com) in your comment. Contest open only to residents of the United States. Incomplete entries will be discarded. Entry deadline is 11 pm (CST) Wednesday, November 7, 2012. Winners will be announced Friday, November 9, 2012. Good luck to all! Thanks Esther and Mary Kole. This interview is packed with so much I can't let myself spend time on this comment; I have to get to work! Please enter my name for the chance to win the 2013 Children’s Writer’s & Illustrator’s Market. A tremendous tool for any aspiring writer. I love the favorite tip about writing a scene from two differing points of view, a great lesson. Thanks for the interview and for making a copy of this invaluable resource available. I ordered Mary's book last week and have read half of it already. I have no doubt I'll be rereading and referencing often. Please enter me in the giveaway. Thanks for a great interview, giveaway, and for spreading the word about a book evry writer should have and use! Thanks to all who've entered our Book Giveaway. Carmela has forwarded many of the entries that - don't - appear here. So far Reese's Peanut Butter Cups - my #1 favorite - is ahead, but M & M's are closing in. Thank you for the giveaway. You've been so generous with them in the past weeks. I follow you on Google Friend Connect. Thank you for the informative post full of good tips, Esther and Mary. My favorite Trick or Treat candy is Nestle's Crunch. I always want some leftovers! Excited about these two great resources for writers! Can't wait to read Mary's book, as I have been a dedicated blog follower and her posts are very helpful. My favorite Halloween candy is also Reese's Peanut Butter Cups! Thanks for the great post Esther! I took Mary's webinar through writersdigest.com earlier this month, it was excellent. Midnight Milky Ways - dark and delicious! Mary critiqued my picture book once. She was encouraging! Her words have kept me in the game for the past year of revisions. Thanks! I appreciated this quote:"You are saying something fundamentally simple in an overly complicated way." Not everything needs to be a showcase for Writing-with-a-capital-W. Sometimes there's style in simplicity." I have to remind myself of that quite often. Thanks! Thanks for the great post, interview and information! I'm looking forward to adding Mary's book to my resource shelf.